Retro red Christmas stockings, my dad’s, my sister’s and mine. That’s a Santa puppet hand sewn by my mother! On a positive note, Today, I brought over to the Sacred Heart cemetary a Grave Blanket of evergreens and a Bid red festive Bow , for my father’s grave. There was still fall leaves in among the Vinca vines that are still alive from earlier in the year. The American flag is missing from my Father’s War Marker. I noted that other graves including my Grandfather’s ( for Uncle Ronnie had American flag at my grandparents grave marker. My grandfather did not fight in any war, said my mother today! She doesn’t have any family to help her except me. I finally got my Christmas tree decorateddyesterday. This is a glimpse of what is still downstairs in the basement. Do you have your first Christmas stocking? 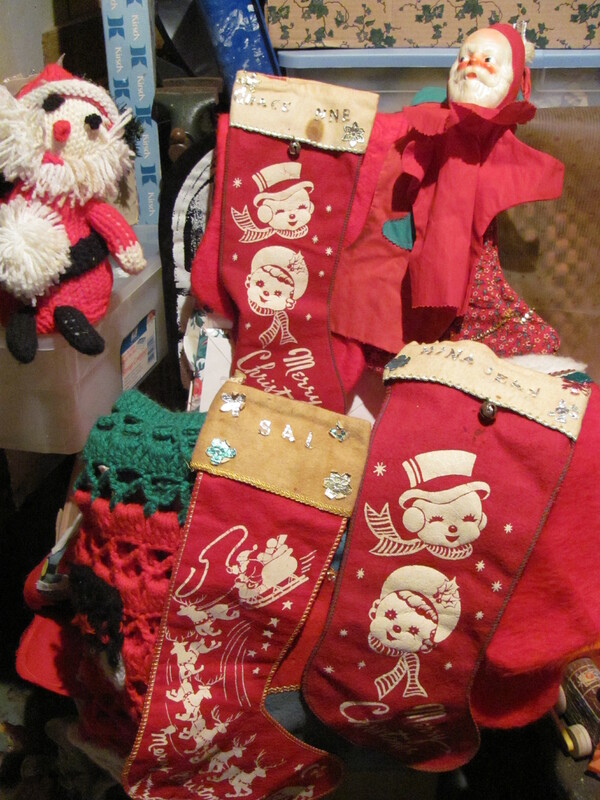 Do you collect Christmas stockings?Happy Ruby Tuesday everyone!